The Braiins OS is an alternative opensource OS for Bitcoin ASIC miners and more specifically for Antminer S9 and DragonMint T1 with support for AsicBoost. The initial release was not that easy to install and use, but looked very promising, but in December last year the second major version named Braiins OS Cobalt was made available and it made things much easier for everyone to switch from the factory firmware. The initial Cobalt release however was missing a crucial feature as we have noted and that was manual fan control as by default the automatic control was keeping high operating temperatures and fans spinning at lower RPM. This has been fixed in the new second release along with some more useful features and improvements worth upgrading to the new release or switching from the stock firmware. 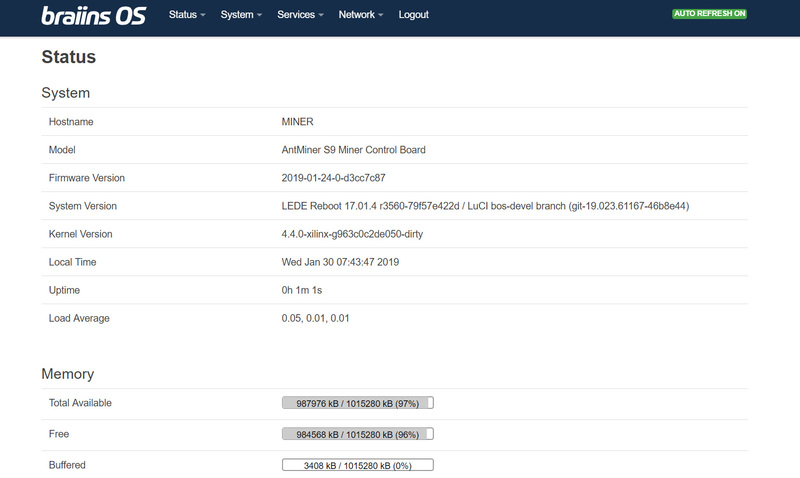 If you want to read the full list of what is new in the latest Braiins OS Cobalt release. 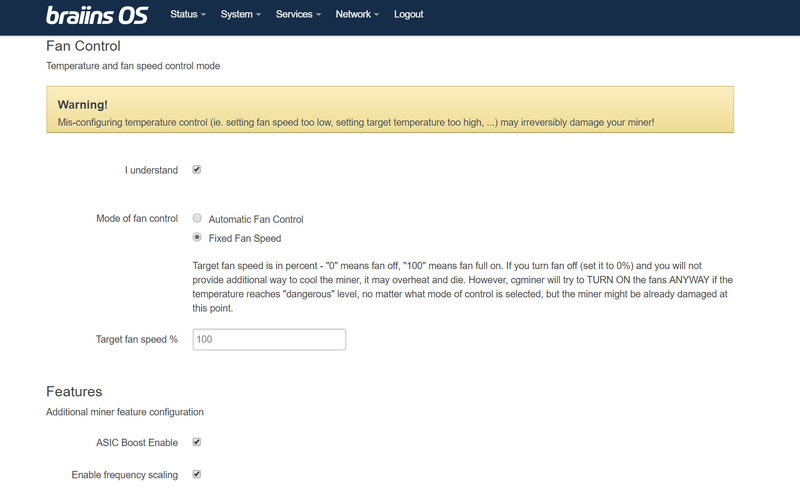 In the latest version you have the option to use either Automatic Fan Control or set Fixed Fan Speed. 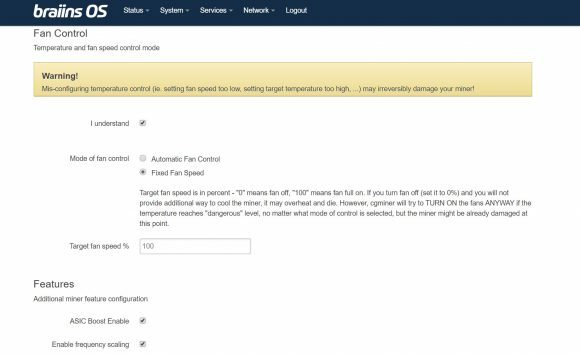 In automatic mode you can set the desired temperature and the fan controller will try to keep as close as possible to that temperature by varying the fan speed. The fixed speed mode is set in percentage and the fans will operate at the set value regardless of the temperature, so you need to be careful with this mode, though setting at 100% target fan speed should be pretty safe. Do note that the operating temperature depends not only on the cooling fans of the miner, but also on the ambient air temperatures and other factors. Another new interesting feature is the new frequency scaling mode that is essentially an overclocking multiplier allowing you to set an overclock by a constant factor for all of the miner chains at once over the overclock settings you may have individually set already. Overclocking is easier in the new release as you are able to lower the temperatures by manually controlling the fan speeds now thus getting more headroom for overclocking. When overclocking also make sure that not only the cooling can handle things, but also the power supply you are using is sufficient enough as well, especially if you start increasing the operating voltages as well and not only the frequencies. Braiins OS has just released a new update to their alternative opensource OS for Bitcoin ASIC miners available for Antminer S9 and DragonMint T1 with support for AsicBoost support enabled. 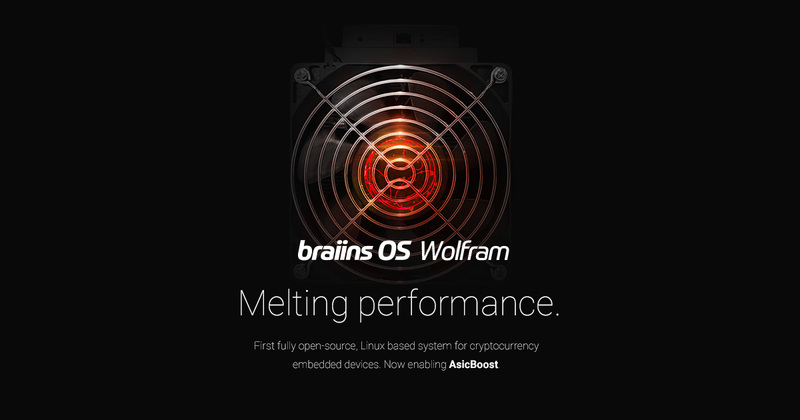 The new Braiins OS Cobalt is here to replace the previous released called Wolfram bringing some improvements such as new status page, per chip frequency calibration for S9, improved bulk upgrades and full compatibility with the Awesome Miner management app. The Cobalt update brings multiple ways of upgrading your ASIC miners from their stock firmware including a version that can now directly be flashed via the stock firmware’s update feature for a really easy deployment. Installing from a PC with Windows is now easier as with the previous release you had to use a Linux PC to deploy the Braiins OS software to your miners and that was not always an easy to do thing for many people. Here you can find more details on how to install Braiins OS Cobalt on the compatible Bitcoin ASIC miners using al supported methods. Braiins OS uses over (version-rolling) AsicBoost in accordance with BIP310, so in order to take advantage of that feature that essentially reduces power usage while maintaining the same hashrate you should go for a mining pool that supports it. With Braiins OS you have easy per chain control of the operating frequency and voltage of the miner, though you should be extra careful when playing with these in order to be on the safe side. 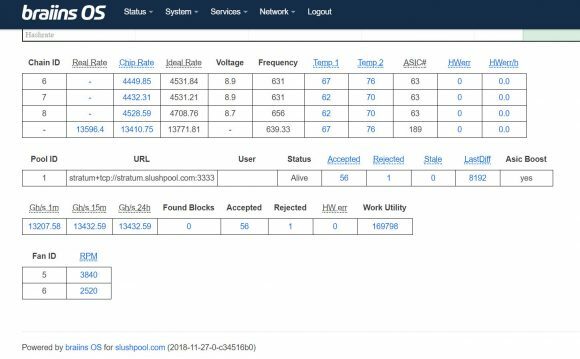 The ASIC Boost is enabled by default, so if you are having trouble connecting to a mining pool then it most likely does not support AsicBoost and you may have to disable it from the settings. One thing however that is still missing in the updated Braiins OS is a user control feature for the cooling fans, the operating system uses automatic fan control maintaining low RPMs and higher operating temperatures. When increasing the voltage and frequency of the miner by overclocking it will compensate with higher RPMs for the fans, but the temperature will still be maintained pretty high for our taste. Unfortunately there is no option to force it to 100% fan for example via the web interface and in our opinion this is a must have feature that is still missing. Other than that we like what we are seeing from Braiins OS and how it is improving with new releases, so if you still have not tried it you might give it a go as an alternative for the stock firmware from Bitmain’s S9 or Halong Mining’s T1. 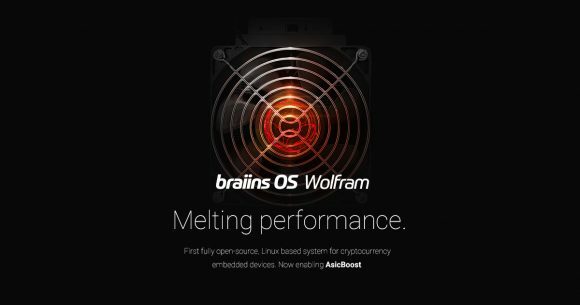 While we are still waiting Bitmain to release AsicBoost support for all of its Antminer S9 variations, Braiins OS Wolfram was made available from the Braiins team. 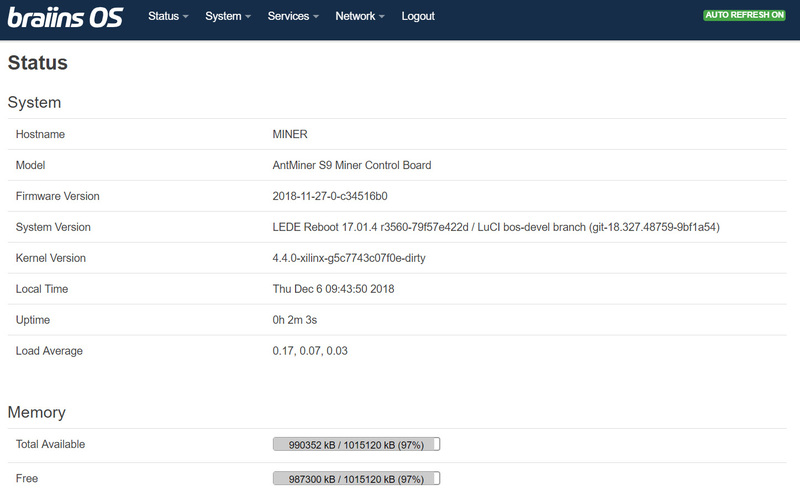 This new release of the Braiins opensource OS for Bitcoin ASIC miners comes with support for all Antminer S9 variants and adds support for AsicBoost as well, it also works on DragonMint T1 (only the variant with Xilinx based control boards). 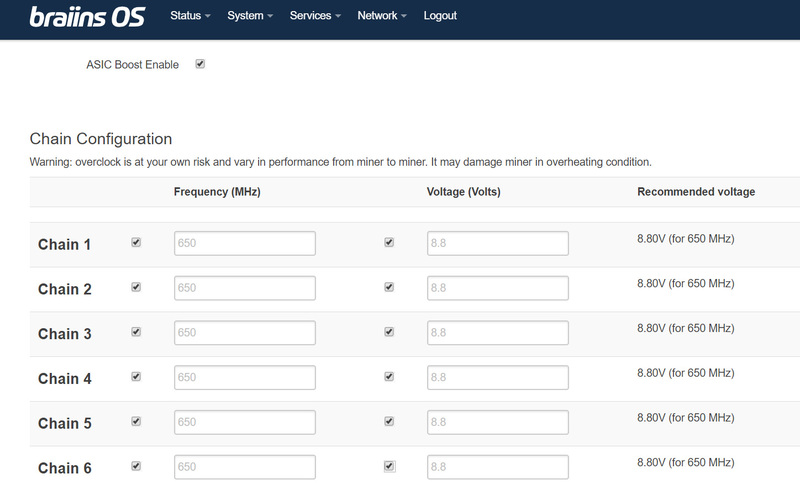 Aside from AsicBoost support on S9 mining hardware, by using the Braiins OS Wolfram you also get the ability to change the clock frequency and voltage for the miners on per hashboard basis, so more tweaking options. Braiins OS uses over (version-rolling) AsicBoost in accordance with BIP310. For Antminer S9, this is currently done using the bitstream provided by the manufacturer, but the goal is to switch to a custom open-source bitstream as soon as possible. All Antminer S9 models (S9, S9i, S9j) are supported, however, the amount of possible variations is rather high, so for this reason it is recommend to test an SD card image first on a single device and once you are confident that the firmware operates according to your expectations, you can apply factory transitional firmware images. Then you can start tweaking the voltage and frequency settings to utilize the extra power savings that you should get of about %13 thanks o the use of AsicBoost.